Some people love cruises. Crystal, one of my favorite bloggers, has gone on a couple in the past year and has written glowing reviews. Some people love them. I will never be one of those people. No, I have never been on a cruise, and I can assure you that I have no interest. This is not something I think I’ll change my mind on. This won’t be something that I’ll one day add to my bucket list. I get motion sickness – For years, I couldn’t go on a roller coaster without getting sick for the rest of the day. I had a few years where I was able to overcome that with motion sickness pills, until I found out the hard way that didn’t work anymore. The thought of rides or things that spin you around in circles make me nauseated. I can’t even go on a swing for more than a couple of minutes. I had a lot of inner ear problems as a kid, and while that may not be tied to the problems I have now, the fact is that getting bobbed up and down for more than a few days is not something I would envision offering any sort of enjoyment. I prefer scenery – When I go on vacation, ideally I like to look at something. If I go to Florida or California, I enjoy the coast. When we go camping, I enjoy the lakes or the woods. Looking out at water would not provide much in the way of scenery for very long. I like relaxing on my vacations – When I go on vacation, I like to settle in for wherever I go. While some might say that a cruise ship would keep me in one place, I know that they tend to stop at various places, where you’re shepherded off the ship for a few hours, only to wait in line to get back on and take sail for the next stop. Sounds rushed, crowded, and touristy. Thanks, but, no thanks. They’re floating germ incubators – How many times per year do you hear about a ship coming back with hundreds of passengers sick from norovirus or some other awful sickness? When you’re confined to what amounts to an oversize raft sailing in the baking sun, you have no escape. Even if you retreat to your cabin once you catch wind that the illness is spreading, it’s probably too late. Speaking of cabins – I’ve seen pictures of most cabins. While I rarely spring for a premium hotel room, I do like having some space to move around. From what I’ve seen, most people find the accomodations tolerable at best. They’re floating sewers – Multiply the number of people on a cruise times the number of meals and snacks that they eat, the number of drinks they consume, and skip past the part of how the human body processes that food, and it just kind of grosses me out when you consider the scale of what is being stored somewhere. Yuck. I enjoy a drink or three while on vacation – Cruise lines definitely want you to enjoy alcohol, but at a pretty steep cost. When I’m in my camper, I can make a $20 fifth of whiskey go a long way. Even if I go on vacation to the beach or somewhere else where I might enjoy more drinks out, I can still choose to mix in my own drinks at the hotel. No such option on cruise ships. The money saving element isn’t there for us midwesterners – If you live along or close to the coastline where cruise ships arrive and depart, you can rack up some pretty big savings, but for those of us that have to fly to get to port, it knocks a big chunk of that savings off right from the get-go. I know a lot of my friends here in Michigan like to go on cruises, so I’m sure the numbers can work, but they don’t work for me. Did I mention I get motion sickness? 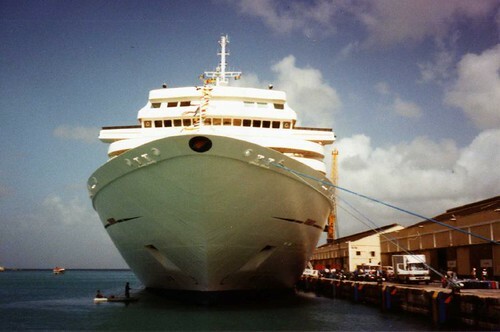 What are your thoughts and experiences with the cruise line industry? Hello, readers! I am Julianne, one of Money Beagle’s college friends and I have been asked to write a little ditty about my frugality – particularly how it pertains to my recent vacation. We were on a cruise last week, and I think our total spent was $172 out of pocket (not including our airfare). Some people do that extreme coupon clipping stuff where they get 100 bottles of ketchup for free and, well, I am a fan of vacationing for cheap. Back in the olden days, before cruising, I would get us to Vegas cheaply. Cruising is a different animal altogether. Cruises are cheapest during certain times of the year. Particularly, during hurricane season (September and October) and during times when kids are in school. A good time in particular is the first couple weeks of December as people are spending a ton of disposable income on the holidays or they are wiped out from Thanksgiving. Conversely, cruises are much more expensive during holidays and times when kids are on breaks from school. Most expensive is the week between Christmas and New Years. This makes sense, right? Well, fares drop when they need to fill up those rooms on the boats. In fact, if you go over to Priceline or Travelocity or even the cruise line’s site, you can sort based on things like the number of days and the lowest to highest price for a particular sailing. Book early. Remember how I mentioned that the boats need to get those rooms filled? They want to fill them up as soon as possible. You can book a year out and get a great rate. If plans change, you can just move your deposit over to another sailing. Or, if you cancel within 75 days of the sail date, you can usually get 100% of your deposit back. Oh, and if you are a senior or a military member, you might qualify for an additional discount! Book often. When you use the same cruise line all the time, you start accumulating free stuff and frequent cruiser perks. On our cruise last week, we received a little booklet with coupons for things like a buy one/get one beer at an on board bar or half off of a coffee from the premium coffee place. We also got invited to special members only receptions that involved free alcohol. There are special embarkation lines for past guests, too. If you have cruise with a line before, they will let you know they appreciated you and will acknowledge it all week long. You might even get some free gifts in your stateroom when you board like a bottle of champagne on ice or flowers. Use credit card points. As long as you pay off your balance every month, there are several different cards that let you accumulate dollars towards your cruise payments or on board credit. 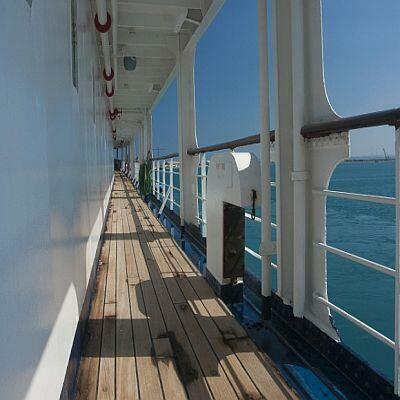 Some of them even provide you with free cruises or free companion fares. A few of them will even give you merchandise like bath robes or golf shirts with the cruise line logo on it. Also, when you sign up for the card, many companies will give you about $100 of on board credit after you make your first purchase. Book on board. In fact, booking on board usually nets you $100 on board credit towards your next sailing. You can book a cruise and then when you get home you can even move it to a different week or a different itinerary. The deposit will move, too. They have special “future cruise consultants” that are more than happy to talk to you about different itineraries or room categories. Book excursions through reputable companies instead of through the cruise line. You can avoid potential mark-ups by booking direct with an excursion company. I’d recommend heading over to cruisecritic.com and read about different excursions that you can take. Cruise Critic is a very comprehensive website where you can learn about ports, cruise lines, different sailings, different ships, etc. Keep in mind, though, that if you’re not just getting started or are in a potentially unsafe area, you may want to consider using the excursions planned out by the cruise company, as they will have checked out the company to make sure they are reputable for you. Plus, since these companies work with the cruise lines, you’ll be safe in knowing that the ship won’t leave without you in the event your bus breaks down or the excursion runs late. Don’t be afraid of an inside room. Of course, a balcony or a suite are fabulous. But, we have found that we can go on twice as many cruises if we get an inside room. There is a bed, a desk, a bathroom, a television — what more do you need? Also, it is dark inside so you can sleep in easily. As a side note, pay attention to where your room is located on the ship. As long as you aren’t taking a gamble and getting your room cheaper doing a “guaranteed” room where they may place you anywhere, you can pick which room you want in the category you have selected. I prefer to be “sandwiched” between floors that contain other staterooms. This makes for a much quieter experience. Don’t pick a room above the jazz club or below the scraping chairs of the buffet tables. Sometimes, if you wait until a week before the ship sails, you cn get a cheap upgrade to a better room. It can’t hurt to call! When you go to the ports, you can usually haggle with the vendors. If they don’t want to haggle, walk away. You will usually find the same t-shirt priced 10 different ways. You can get cheap jewelry, cheap liquor, cheap prescription drugs… just look! Even the gift shops on board will run specials through the week. Ask the people working in the shops if they think something will go on sale and/or if you can get refunded the difference if it does. Lastly, take advantage of the activities on board. Every night when your room is cleaned, you will get a little newspaper delivered that tells you what the activities will be for the following day. Bring a highlighter pen with you and highlight what you would like to do. There are countless fun things like trivia contests, Vegas style shows, water aerobics, kids activities, karaoke, seminars about cooking or wines, belly flop contests, etc. Some ships even have surfing simulators, rock climbing walls, and ice skating rinks! I hope some of these tips will be helpful! Happy cruising!! Time off is one of those things that has gotten a bad reputation. Companies give you time off, but some will look down on you for using it. Many people freely admit that they avoid taking all of their time off for fear of being seen as lazy or dispensable. I try not to feel guilty about using my time off. I feel that if the company gives employees time off, they are counting on you using it. If companies actually give employees hassle about using it, then it seems silly to even be working for that company in the first place. There are some tips you can follow so that you can take your time off without feeling guilty about it. Know your company / department – Taking a week off shouldn’t be a problem, but if you plan on taking more than that off at one time, you should make sure your company and department can handle that. Most tasks can be put off a week or so, but if you’re handling important things that can’t be shifted around, it will start making people nervous if they get put off for too long. Get ahead of the game before you leave – If you’re heading out for a week, try to get some of the things you would normally do done before you leave. Transfer any responsibilities that have to be done – If there are things that need to get done that you have to transfer to someone else, make sure they understand completely what is being done. Send out a ‘reminder’ e-mail to anybody doing your work – If you ask someone else to do something, they agree to do it, and it doesn’t get done, guess who gets the blame? You. This can often be avoided by sending out an e-mail a couple of days before you leave. A simple “Just want to confirm that you will be doing such and such task next week while I’m gone. If you have any questions, please let me know before Friday afternoon. Thanks so much!” Copy your boss. Trust me, the work will get done. Make sure to update your calendar, voice-mail, and out of office reply. This should need no further explanation. Make sure to remind your boss that you’ll be off– If you plan your time off for July back in March and your boss approves it, that gives him/her four months to forget all about it. Dropping by a few days before your time off saying ‘Hey, just a reminder that I’m off next week, do you need anything from me?’ can often avoid a messy situation for your boss (that will then unavoidably transfer to you). Follow up when you get back – The morning you get back you should run through your voice mails and e-mails, responding to anything urgent, and you should also stop by your bosses office (as well as any colleagues who were handling your tasks). No matter how best you prepare, things will often blow up while you’re gone, and the best thing you can do is put out any fires as quickly as you can. Do these things and you shouldn’t feel guilty about taking time off. Any other tips you have to ensure relaxing time away? Have you had any time-off horror stories? Take A Vacation From My Problems? You Bet I Will! I love silly movies, so it should be no surprise that What About Bob? is one of my all time favorites. It’s now been twenty years since it comes out, but it can still draw more than a few laughs out of me every time I see it. 1) “Take a vacation from your problems” – One piece of advice that a neurotic Bob (Bill Murray) receives is to take a break from all that worries him. Simply put it aside. This is pretty good advice. I remember another movie (can’t remember what it was) where the lead character, before entering his home every day, ‘hung his problems’ on a tree outside the door. When his kid asked him why, he said that he hung them there and when he left in the morning the next day, there were always less there than he had left. Everybody has problems, but they can’t be allowed to take over our life. 2) Baby steps – Many things in life for Bob were simply too daunting (often to hilarious results). The advice was to break big tasks down to baby steps. This is so true. If you’re trying to lose weight, I say break your overall goal into ten mini-goals that are 10% each of your total goal. Making these achievements will keep you focused on the bigger picture. The same holds for personal finance goals. If you want to save a large sum money or pay down debt, don’t make your goal the end number, set mini-goals along the way so that you can feel accomplished and stay motivated. 3) Pass along what you’ve learned – As the movie goes on, Bob is able to conquer some of his fears. He then passes along his new knowledge to a child who is afraid to dive into the lake. He’s eventually able to help the kid along with the knowledge he learned. If you are able to make progress in your goals, help others who might be looking for help. Have you ever taken away lessons from a silly movie?